Cabinet minister Michael Gove addressed a large DUP fund-raising dinner in Ballymena on Thursday night which was attended by the PSNI chief constable George Hamilton and senior business figures. The Environment Secretary addressed an audience of more than 200 people in the heartland of the DUP founder Ian Paisley. Many of those present for the DUP business dinner at Tullyglass Hotel in Ballymena were not DUP members and the room contained representatives of the Ulster Farmers’ Union and business representatives. One individual present at the event told the News Letter that Ian Paisley Jr, who succeeded his father as North Antrim MP, had extolled the quality of Bushmills Whiskey and that bottles of Black Bush were part of a fund-raising effort. 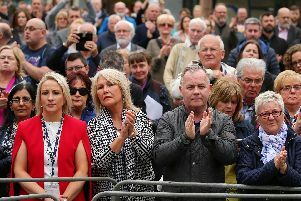 Local DUP councillor John Finlay said that he was “very encouraged by his speech” which had included a “great accolade to both the PSNI and the RUC” and had also delivered a message on Brexit which was well-received by the DUP. Mr Finlay said that he did not know how much the tickets had cost because his had been free. The PSNI said that Chief Constable George Hamilton had been present as a guest of Mr Paisley, had not paid for his ticket, had not financially contributed in any way and was “happy to consider opportunities for engagement at that level from any and all political parties”. Mr Gove was a vocal opponent of the 1998 Belfast (Good Friday) Agreement, which he viewed as a capitulation to the IRA. Sinn Féin criticised Mr Gove for cancelling a meeting with them during a visit to Northern Ireland in the summer. However, on Thursday Mr Gove met Sinn Féin representatives at Stormont.